Shuffling westwards from the Embarrassments of Ellesmere Island we quickly encounter the wonders of Axel Heiberg Island and enter a strange realm of mainstream absurdities. But let’s start with the natural [wooden] wonders of Axel Heiberg Island. The fossil log in the picture was most likely knocked over during flooding, and then buried. Some of these knocked over logs can be up to 8 meters long. Now let’s dip our toes into the mainstream weirdness. Apparently, the 40 or 50 [depending upon source] million year old mummified wood found on Axel Heiberg Island still “contains all its organic matter”, “can still be burned” and is “so well preserved that it is difficult to distinguish from present-day samples”. The eastern part is hilly, with local plains. It was on this side of the island that large tree stumps were discovered in 1985. The stumps have since been dated at 40 million years old, evidence that the Far North was at that time much warmer and wetter. This “Fossil Forest” is not petrified but contains all its organic matter, making it a unique glimpse into an ancient ecosystem. The stumps, logs, seeds, cones and leaves are in some cases so well preserved that it is difficult to distinguish them from present-day samples. Thus far, we are in similar territory to the Embarrassments of Ellesmere Island. However, as we plunge into the details we discover the mainstream has unearthed wood from [at least] six species of tree on Axel Heiberg Island. 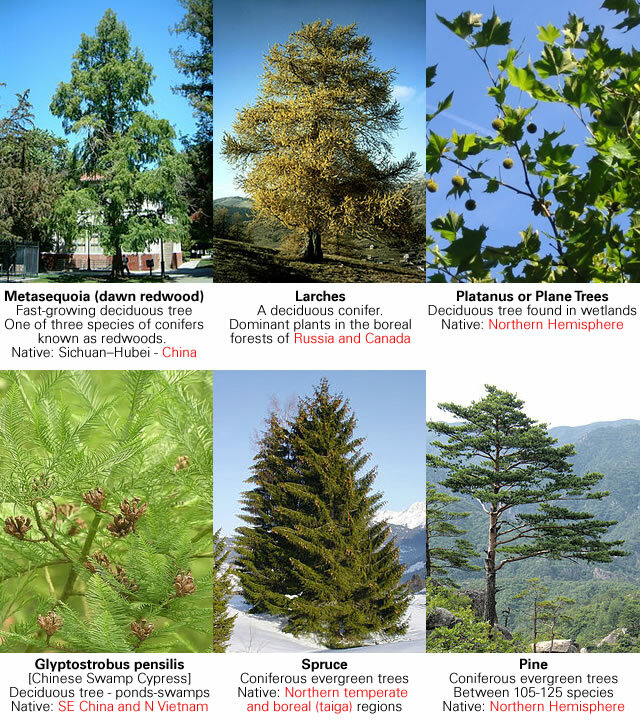 The most common tree species is dawn redwood (Metasequoia sp), but larch, plane-tree sycamore (Platanus sp), Chinese water chestnut (Glyptostrobus sp), spruce and pine have also been found. Animal evidence of semitropical Axel Heiberg was found in the late 1990s when alligator and turtle fossils were found at Mokka Fiord and fossilized tooth fragments of an extinct huge rhinoceroslike herbivore, Brontotheriidae, were found in the fossil forest site. These six species are a weird and wonderful collection of deciduous and evergreen trees that thrive in a variety of environments from around the northern hemisphere. There are Dawn Redwoods from China mixed with Plane Trees that thrive in the United Kingdom. There are hardy evergreen Spruce mixed with deciduous Chinese Swamp Cypresses. Furthermore, hardwood litter [from angiosperms] is frequently mixed with softwood litter [from gymnosperms] in the same [narrow] stratigraphic layer. Stratigraphic sequence illustrating fossiliferous sediments of Fossil Forest; sampling location for this study is highlighted, as is position of brontothere fossil teeth described by Eberle and Storer (1999). Obviously, explaining away this weird and wonderful collection of world wide wood has severely taxed the creative imagination of the mainstream because no trees currently grow at 80° N.
This is hardly surprising because trees don’t thrive in an Arctic Desert [annual precipitation just above 3 inches] when the Monthly Average High Temperature only gets above freezing for three months of the year [Eureka 79°59′20″N on Ellesmere Island] and there is no sunlight for 4 months of the year. The settlement sees the midnight sun between April 10 and August 29, with no sunlight at all between mid-October and late February. 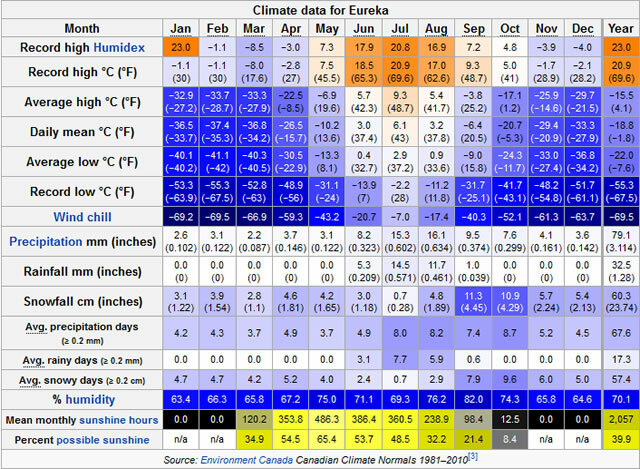 Eureka has the lowest average annual temperature and least precipitation of any weather station in Canada with an annual mean temperature of −18.8 °C (−1.8 °F). Winters are frigid, but summers are slightly warmer than at other places in the Canadian Arctic. Even so, since record keeping began, the temperature has never exceeded 20.9 °C (69.6 °F), first reached on July 14, 2009. Although a polar desert, evaporation is also very low, which allows the limited moisture to be made available for plants and wildlife. Eureka is the location in the world with the highest average hours of sunshine in any single month, namely May. The Farthest North Spruce Tree in Alaska grew around 120 miles above the Arctic Circle at [about] 68° N until it was “murdered” by an “axeman” in 2004. 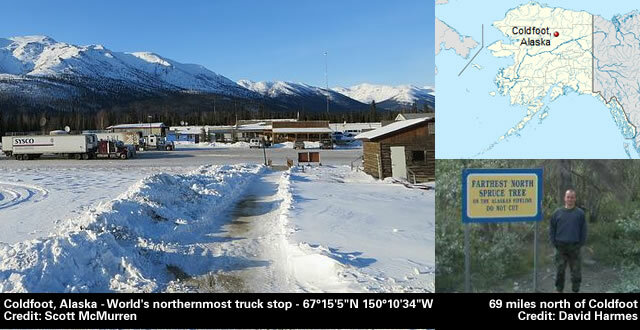 Coldfoot primarily serves as a truck stop on the Dalton Highway from Fairbanks to Prudhoe Bay. North of Coldfoot, there are no services for 240 miles (400 km), until Deadhorse. In Coldfoot, Alaska, an anonymous vandal has savaged a tourist attraction. The celebrated Farthest North Spruce Tree on the Alaska Pipeline, a popular tourist stop, was mortally damaged in July when an unknown axeman chipped away an expanse of bark around the tree. There are no clues to the identity of the deranged Bunyan(s). Directions: Between mileposts 235 and 237 on the Dalton Hwy. Roughly 69 miles north of the hamlet of Coldfoot, and 120 miles above the Arctic Circle. Overall, the northernmost tree [of any kind] grows at 73° N in Siberia according to Wikipedia. 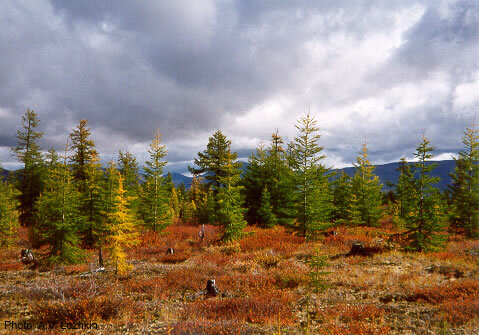 Dahurian Larch, Larix gmelinii, is a species of larch native to eastern Siberia and adjacent northeastern Mongolia, northeastern China (Heilongjiang) and North Korea. Larix gmelinii is a medium-sized deciduous coniferous tree reaching 10-30 m tall, rarely 40 m, with a trunk up to 1 m diameter. About 150 km west of Khatanga River outfall, Taymyr Peninsula, Siberia, Russia. 73°04’32”N 102°00’00”E is the northernmost location of any tree. However, undaunted by these severe natural constraints the mainstream [unbelievably] claim that this weird and wonderful collection of world wide wood grew on Axel Heiberg Island because the Arctic was “a warm sub-tropical place similar to the swamplands of Florida today”. It is known for its unusual fossil forests, which date from the Eocene period. Owing to the lack of mineralization in many of the forest specimens, the traditional characterization of “fossilisation” fails for these forests and “mummification” may be a clearer description. It is clear that the Axel Heiberg forest was a high latitude wetland forest. Over 40 million years ago during the Eocene era, a forest of tall trees flourished on Axel Heiberg island. The trees reached up to 35 metres in height; some may have grown for 500 to 1,000 years. At the time, the polar climate was warm, but the winters were still continuously dark for three months long. As the trees fell, the fine sediment in which the forest grew protected the plants. Instead of turning into petrified “stone” fossils, they were ultimately mummified by the cold, dry Arctic climate, and only recently exposed by erosion. However, the story moves well beyond the absurd when the mainstream simply rejects its own evidence that the Arctic was cold during the Eocene. When we used this to estimate Eocene paleotemperature from our Axel Heiberg fossil wood δ18O results, we obtained predicted mean annual temperature for the site equal to –2.7 °C (± 2.5). For comparison, mean annual temperature in Dawson, Yukon, Canada, is –4.7 °C; Godthåb, Greenland, is –1.1 °C; and Whitehorse is –0.9 °C. Thus, paleotemperature predicted for Axel Heiberg Island using equation 1 would have been similar to modern Arctic regions. The Arctic could not have had below-zero mean annual temperature during the Eocene based on climate models and also based on the apparent high bioproductivity of the Fossil Forest during the Eocene. The extremely bioproductive Eocene Metasequoia forests of Axel Heiberg Island were deciduous ecosystems restricted to a short, intense growing season. These trees endured four months of total darkness during winter months and gained most of the light required for growth during four months of continuous summer daylight. 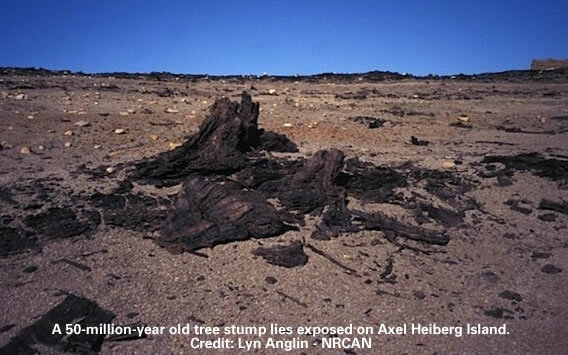 However, an simple analysis of the mainstream data clearly reveals the story behind the Axel Heiberg Island “mummified” trees. of latitude, modern Metasequoia wood from Japan (green circles), and fossil Metasequoia wood from Fossil Forest site (red diamonds). An estimated trend line [based upon the δ18O values in modern trees (blue circles)] very clearly indicates than NONE of the Axel Heiberg Island Metasequoia cellulose (red diamonds) grew [in-situ] at 80° N.
This very strongly implies that ALL of the Axel Heiberg Island Metasequoia wood (red diamonds) is flotsam deposited by a series of catastrophic tidal waves. a) The numerous thin debris bands in the stratigraphy [see above]. b) The mainstream commentary regarding recurrent “great floods”. These flora were not permineralised because of the way they were buried. While they were still living in the Eocene, the forests were covered by silt filled flood waters. The silt blocked out the mineral rich water and protected the flora from being replaced with the silica in the water. These great floods were not a yearly occurence. Instead they occured perhaps every 10,000 years. It was this flooding that preserved what the forest was like. After the floods, a new forest would grow on top of the old one. There were at least 19 such events on Axel Heiberg Island. Intriguingly, the trend line indicates that the Axel Heiberg Island Metasequoia trees (red diamonds) grew [on average] at 55° N and this is approximately 20° north of their current habitat. This opens up the possibility that the “great floods” were caused by a series of “jerks” that altered the axial tilt of the Earth from [say] 3° to its current value of about 23°. An antediluvian Earth [with a 3° axial tilt] would have experienced a far more equitable climate [with an expanded equatorial climate zone] that may have enabled Metasequoia trees to flourish between 50° N and 60° N.
This conjecture is supported by “mummified” tree ring observations from Ellesmere Island where the growth pattern is seen to be very crisp, clear and evenly defined whilst also lacking the discolouration [that is frequently seen in modern day tree rings] associated with frost damaged cells. Gallery | This entry was posted in Catastrophism, Earth, Greenland, Inventions and Deceptions, Radiocarbon Dating. Bookmark the permalink. A point of clarification. 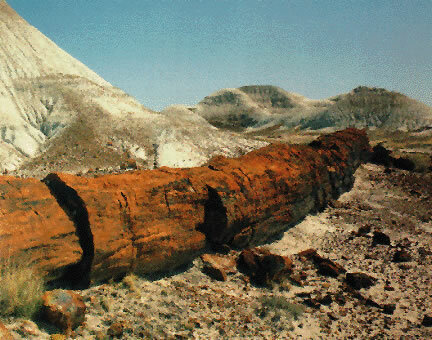 This article mentions that the fossilized forests on Axel Heiberg were “discovered” in 1985. Imperial Oil and Panarctic drilled near the Mokka fiord in the late 60-early 70’s in which I was involved and we examined a number of the sites at the time. They were well known by oil company people and the helicopter pilots. I was there in 1980 and they were well known by then. 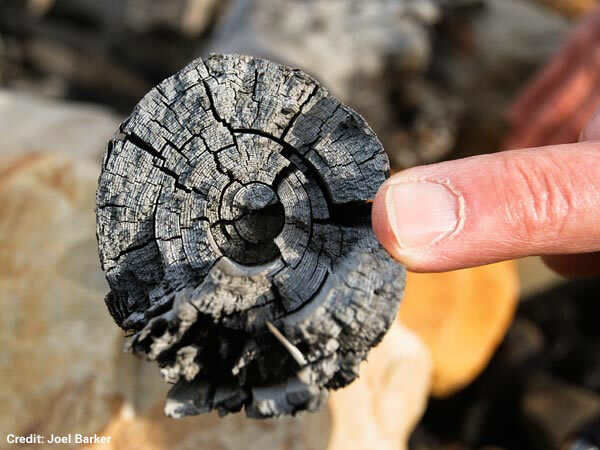 There are old reports suggesting fossilized wood has been found on Greenland but I have yet to find a well documented example, diagram or photograph. Therefore, any source suggestions or photographs would be very welcome! Evan is correct about the fossilized wood being found in the late 60’s or early 70’s. I was up there to flight check Imperial Oil’s VOR/DME and conversed with some of their geologists and they mentioned finding fossilized trees. I believe a cypress tree was mentioned. Evan — Do you recall the exact co-odinates of the drill site and runway location. regarding the findings of fossilized tree remains found in coal in central West Greenland on Nuussuaq Peninsular north of Ilulissat. Mentions Metasequioa, Ginkgo Biloba, Pinus MacClurii, Birch – which have been found fossilized on Hareøen, Beech, Oak, Chestnut, Walnut, Acer, Fraxinus, Cercidiphyllum, Platanus,Elm, Vitis with the remain of a petrified forest to be found at Aternikadluk close to Quikasaap Kuua. Also another article on DNA finds -http://www.nbi.ku.dk/Nyheder/nyheder_07/fossilt_dna_opklarer_fortidens_liv_og_klima – in the frozen mud waters under DYE3 icecore pointing to remains of the same flora and dated on insect mitrocondia to be at least 450.000 BP. Dating of dust within the icecore indicate that during the Eem interglacial 125.000 BP the Greenland icecap would have been in place and having been in existence since 450.000 BP much to the surprise of science! The addendum indicate that during the Eem interglacial the Greenland icecap wouldn’t all melt but only add a volume to increase global sealevels of 2 meters. Wondering what animal life you viewed or heard of on Axel Heiberg in your visits ? If the earth did stop spinning any animal that wasn’t thrown off it’s feet and broken apart by the forces would stand a greater chance of being first cooked then frozen and fossilized the nearer it was to the equator, and probably a better chance of survival if it was on the western side of a hill with sufficient gradient to prevent it flying off towards the east, and high enough up the hill to avoid the oncoming flood. Interesting thought there John. I have another explanation for the existence of these trees so high in the Arctic. Right now there is great concern over climate change and the potential greenhouse effect it will cause. What if sometime in the past the earth’s atmosphere was different than it is today and the earth was one large greenhouse? Quote ” — earth’s atmosphere was different than it is today — “. I did argue once that we might be like yeast in wine, engineered to get back carbon locked in the ground as coal and put it back into the atmosphere as per original design. And of course, like yeast, drown and suffocate in the resulting concoction. Then COP-24 should rouse the gods from their slumber. Ron, that may well be so, even more interesting would be if when the earth stood still [and moved to a more remote orbit] the interior grew so hot that the land masses disconnected from the mantle at the moho, and just as it actually appears, to a child[me then], the land masses also slid north. Shrinking a vast warm Arctic ocean. A huge amount of friction generated heat and the possibility of kimberlite type tubes reaching almost to the moho as a result to release the pressure spouting varieties of minerals dissolved in supercritical water.